"Here, in this place, I am a God." 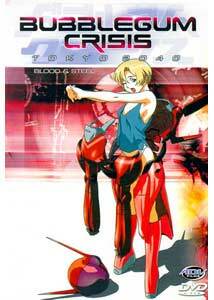 With this disc we reach the second-to-last installment in Hiroki Hayashi's Bubblegum Crisis Tokyo 2040 series. ADV has gone an extra step and bumped the per-disc episode count up to five for this and the upcoming final release. After the last episode on disc four, I was really looking forward to this installment, and while I have some reservations about the choices ADV is making with regard to packaging, the series still holds up well. Galatea (Yui Horie), introduced a couple of discs ago, has been causing trouble ever since she arrived on the scene, and the present is no exception. At the conclusion of the previous disc, the A.D. Police were on strike over their pending dissolution, leaving the police tower empty save for Nene (Hiroko Konishi), who stayed in the communications center, and the police chief and two aides in another area of the building. Galatea's influence had reanimated the thousands of mad boomers warehoused in the tower basement, and the chief and company were battling their way out of the building. With all communication lines to the outside world cut off by the building's security measures, the four remaining humans were on their own, trying to outgun and outsmart the hordes of mad machines bent on their destruction. During the course of these episodes, additional background information helps put some of the pieces previously dangled before us into perspective, though nothing is simplified. By the end of the disc we are left with another major cliffhanger, making the wait for the next issue that much more unbearable. There is plenty of action, and the new developments over in the Knight Saber labs put some new and interesting demands on the girls. In this set, we also delve deeper into the personal relationships between many of the characters. With only five more episodes to close the series, I think we are in for one heck of a finale. Image Transfer Review: The first few episodes appear up to the standard set by the previous discs in the series, though the last two episodes exhibit far more interlacing than the first three. There are also a couple of spots where background gradations solarize a bit and become blocky. Aliasing is present here and there, but the overall look is very good, with solid color and black levels for the most part. Audio Transfer Review: Sound design remains a strong point, though the stereo presentation does seem very center- focused most of the time, widening primarily for music cues. Audio is clear with no distortion. The disc offers the original Japanese language track, as well as English and Spanish dubs. Extras Review: We get more front-end trailers, this time for Farscape, Shadow Raiders, Orphen, Arc The Lad, Princess Nine, and A.D. Police. These can be 'title skipped' through or bypassed completely using the menu button on the DVD remote. While we get five episodes on this disc, extras are slim, with only four character profiles featuring concept drawings of each girl's hardsuit. They have also revised the menu design, and the theme song has been replaced in the menu. Leave it to me to speak too soon about the covers. In my previous review I mentioned that the Bubblegum Crisis Tokyo 2040 spines had finally been standardized, but this time we have another new design which disrupts the look of the whole series. The disc title, which first appeared on the third disc, has had both its typeface and location changed. They've also moved the logo upwards on the spine so that it no longer lines up with the other discs. What on Earth were they thinking? I hate this! Bad, bad, bad! At least they finally put Nene on the cover. An exciting and interesting series continues to impress. Great action, good character development, and an involving plot make Bubblegum Crisis Tokyo 2040 a highly entertaining investment. I do wish ADV could have standardized the packaging, as the lack of consistency here does not get very high ratings, despite a good design.